A wine of prestige for Nova Scotia, it is a delight for all senses. Nova Scotia’s most aromatic grape variety was used to make this slightly pink in colour wine. The nose shows intense tropical fruit aromas of lychee fruit, passion fruit and hints of pink grapefruit and rose. Despite the illusion of sweetness displayed on the nose, this wine finishes dry with a long grapefuit finish. 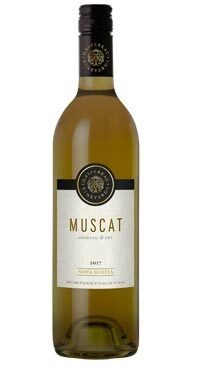 Muscat is the perfect partner with crab cakes, curry dishes and shellfish. It is truly a Nova Scotian culinary delight!